This large, multi-story building stands tall over the large parking lot surrounding it. Wood planking cover the outside of the building, taking up the entire first floor. White framed windows take positions at intervals around the outside, with double doors at the front and back allow for entry. Dark brown shingles flow down from the roof, past the top floor, before stopping just underneath the upstairs windows. Several chimneys extend from the roof of the building. 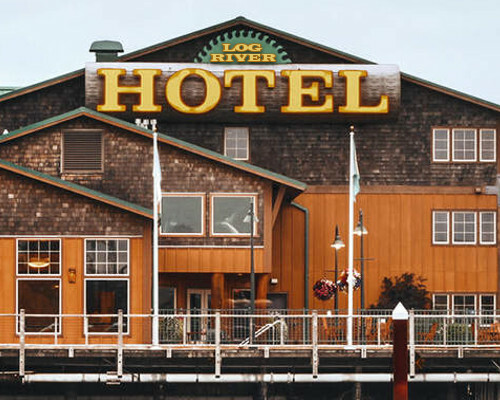 High over the entrance is a large sign in the shape of a fallen log which reads, "Hotel". A smaller sign above and center of the fake log is a forest green sign in the shape of a circular saw blade which reads, "Log River". The lobby is a large room with one side taken up by long counters with several computer screens on top. A sign above one part reads, "Check In", another reads, "Check Out" and a finally one reads, "Concierge and Information". 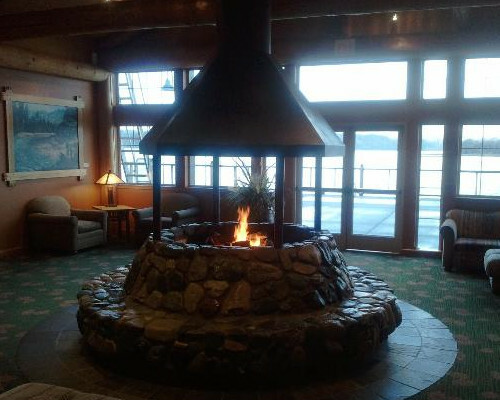 In the center of the lobby is a large circular stone fireplace, a gentle red flame extending up from the middle and into a copper hood overhead which extends into the ceiling high above. Surrounding the fireplace are several comfortable chairs and low tables, as well as a display containing several pamphlets for local tourist stops and restaurants. The walls are the same wood paneling as the outside and are covered with pictures from local artists depicting scenery and wildlife that are popular in the area. The building also acts as the SOTA Community Center so many artifacts of the natives are on display as well as paintings, portraits, and plaques dedicated to the chiefs and prominent legends and members of the local tribes take up a lot of area in the lobby. A long hallway extends from the main lobby to an exit door at the end. The walls are wood paneled, and the carpet is a dark grass color, with the imprint of leaves spread over it. On either side of the hallway are doors leading to the individual rooms, each door a dark wood color with a number burned into it. Soft light in round sconces hangs from the ceiling in regular intervals, spreading light all the way to the far door. Between the room doors, there are large framed prints of many local animals and native legends done in the northwestern tribal art style. This large open room can fit several hundred people quite easily. A tall ceiling, well over 20 feet in height, has large lights hanging down to brighten up the large space. The walls, covered in wood paneling, are bare and empty to allow anyone renting the space to use them as they need. The convention hall itself is designed to handle almost any sort of meeting or convention that might be set up. The overall theme of the rooms at the Log River Hotel is a rustic lodge. On either side of the entry are an open doorless closet and a small changing area containing a sink and a large, well-lit mirror. Beside the mirror is the door that leads into the bathroom. The bathroom is a bit small containing a mirror over the back of the toilet and behind the door, and small bathtub with shower. The whole area is tiled in small white and blue tiles. Above the toilet is a sign detailing how to change the bathroom into a sauna. Straight through the door is the room itself. It contains two twin log wood lodge style beds covered in dark green duvets with elk and wolf colored silhouettes strolling across the cover. The beds are set apart by a small nightstand table with a lamp and digital alarm clock on it. Across the room from the beds is a long clothes bureau with a flat screen television on top, along with a coffee pot, a basket of tea and instant coffees and powder creamer and sugar, and three glasses covered in plastic. On the exterior wall of the room is a large window with heavy beige with rusty red animal track patterned curtains with a separate lighter more sheer set of white curtains within the heavier drapes. 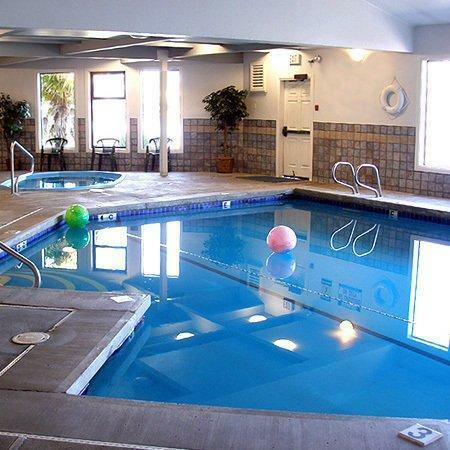 The overall theme of the rooms at the Log River Hotel is a rustic lodge. On either side of the entry are an open doorless closet and a small changing area containing a sink and a large, well-lit mirror. Beside the mirror is the door that leads into the bathroom. The bathroom is a bit small containing a mirror over the back of the toilet and behind the door, and small bathtub with shower. The whole area is tiled in small white and blue tiles. Above the toilet is a sign detailing how to change the bathroom into a sauna. Straight through the door is the room itself. It contains a queen log wood lodge style bed covered in a dark green duvet with elk and wolf colored silhouettes strolling across the cover. On either side of the bed are small nightstand tables with a lamp and digital alarm clock on each. Across the room from the bed is a long clothes bureau with a flat screen television on top, along with a coffee pot, a basket of tea and instant coffees and powder creamer and sugar, and three glasses covered in plastic. On the exterior wall of the room is a large window with heavy beige with rusty red animal track patterned curtains with a separate lighter more sheer set of white curtains within the heavier drapes. 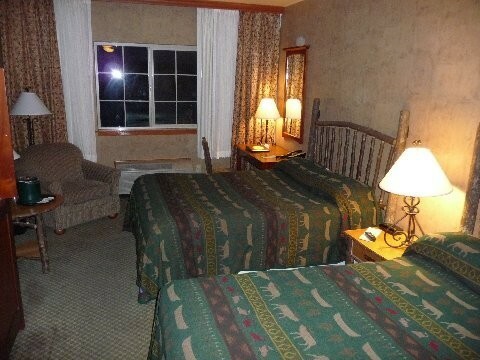 The overall theme of the rooms at the Log River Hotel is rustic lodge. On either side of the entry are an open doorless closet and a small changing area containing a sink and a large, well-lit mirror. Beside the mirror is the door that leads into the bathroom. The bathroom is a bit small containing a mirror over the back of the toilet and behind the door, and small bathtub with shower. The whole area is tiled in small white and blue tiles. Above the toilet is a sign detailing how to change the bathroom into a sauna. Straight through the door is the room itself. It contains two queen log wood lodge style beds covered in dark green duvets with elk and wolf colored silhouettes strolling across the cover. The beds are set apart by a small nightstand table with a lamp and digital alarm clock on it. Across the room from the beds is a long clothes bureau with a flat screen television on top, along with a coffee pot, a basket of tea and instant coffees and powder creamer and sugar, and three glasses covered in plastic. On the exterior wall of the room is a large window with heavy beige with rusty red animal track patterned curtains with a separate lighter more sheer set of white curtains within the heavier drapes. The overall theme of the rooms at the Log River Hotel is a rustic lodge. On either side of the entry are an open doorless closet and a small changing area containing a sink and a large, well-lit mirror. Beside the mirror is the door that leads into the bathroom. The bathroom is a bit small containing a mirror over the back of the toilet and behind the door, and small bathtub with shower. The whole area is tiled in small white and blue tiles. Above the toilet is a sign detailing how to change the bathroom into a sauna. Straight through the door is the room itself. It contains a king-sized log wood lodge style bed covered in a dark green duvet with elk and wolf colored silhouettes strolling across the cover. On either side of the bed are small nightstand tables with a lamp and digital alarm clock on each. Across the room from the bed is a long clothes bureau with a flat screen television on top, along with a coffee pot, a basket of tea and instant coffees and powder creamer and sugar, and three glasses covered in plastic. On the exterior wall of the room is a large window with heavy beige with rusty red animal track patterned curtains with a separate lighter more sheer set of white curtains within the heavier drapes. A suite. 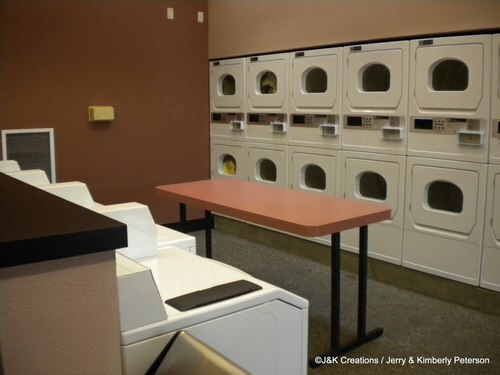 Kitchenette, Dining area, 2 bedrooms, 2 bathrooms, living room with a bar and a slot machine on the bar.